Another day of a couple of hundred cups, and a chance to recup my favourites against each other again. The final lower grade coffees left to cup of the 13th auction catalogue were also on the table, most of which were ridden with a world of defects, phenol, ferment and mould in unpleasant symphony. But as I hoped, good samples of outturn week 19 just made it in time for my last day at Dorman. I’ve identified a few factories and an estate that I like more than one screensize of, some old favourites and some interesting new acquaintances. I’ve been lucky to be the only buyer cupping at Dorman for two days now, I just avoided a large posse of roasters yesterday so the lab is nice and quiet. Nevertheless, cupping alongside the force of nature that is Bridget is a whirlwind of it’s own, as she zooms through the bowls bombarding us with her cupping scores while Lydia furiously scribbles them down as fast as she can. It’s a lot of fun to watch but I don’t envy her the job, making such split decision calls on quality is far more demanding than what I’m used to even from the COE. Dinner was the obligatory meal at carnivore, where the waiters bring chunks of meat grilled on swords until you capitulate and put your table flag down. Delicious as the meat is, the best part of the meal for me was the cat that decided to sit on my lap for an hour, and the Dawa, a lovely local cocktail with lime and honey. Early next morning we set off up towards the town of Othaya to visit the nursery and farm of the Othaya Farmers Society. A roughly 2 hours drive, the road took us past views of Mt. 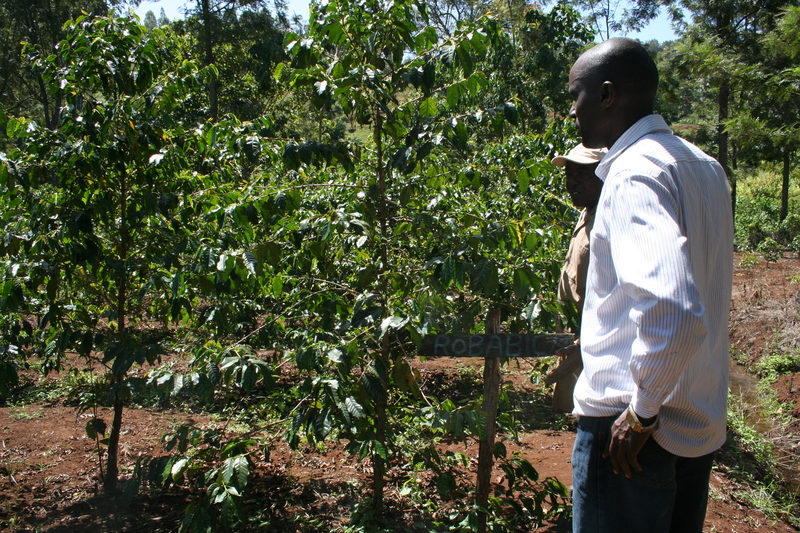 Kenya and through both tea and coffee plantations. At the nursery, Edward and James took us around to where the SL and Batian (named after one of the peaks of Mt. 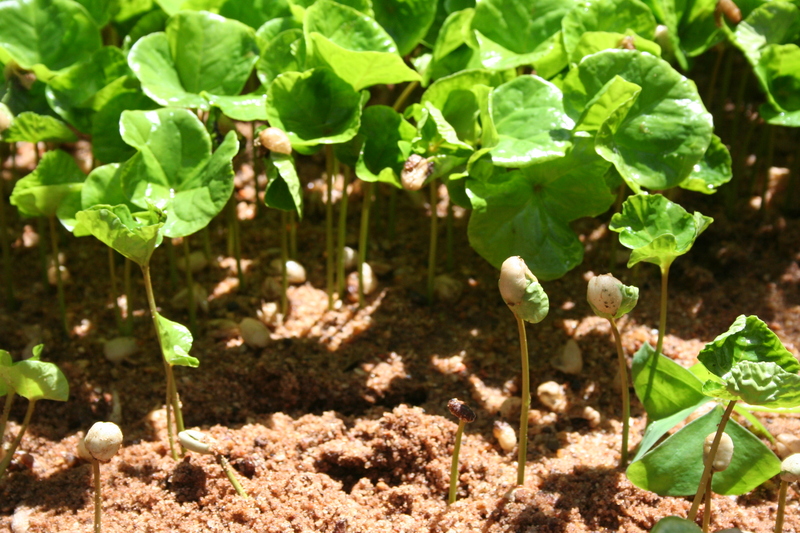 Kenya) seedlings were spread out under shade netting at various stages of maturity. The members of OFS come here to get young trees to replenish, replace or expand their current stock, paying 35 KSH per tree. 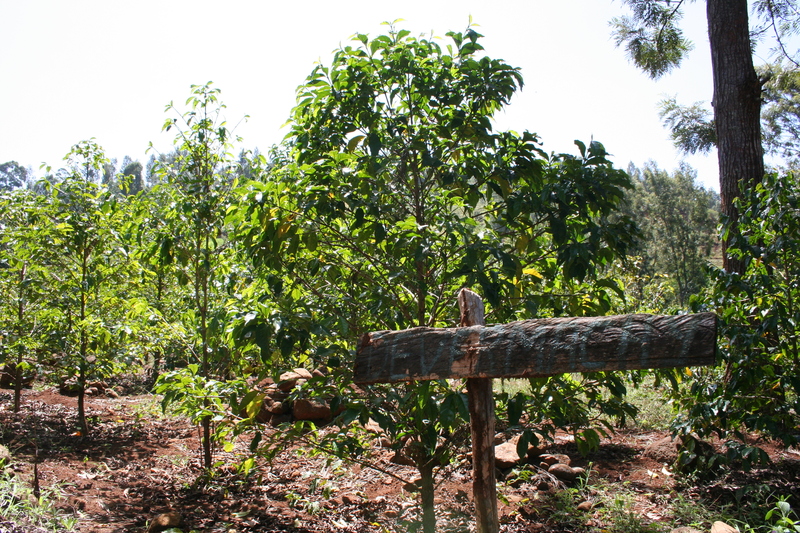 They also have an experimental coffee garden on site, established in 2009 using seeds from the Coffee Research Foundation. Along with SL’s and various early versions of Batian they also had some Indian varieties, like Dvermachy and Robabica. In the fertile soil onsite and with plenty of access to water from the two streams that meet nearby, the various trees have been left to perform as they naturally would under optimal conditions, giving valuable information to the researchers. After the nursery we drove to one of the 19 (soon to be 20!) factories under OFS; Ichamama. About 1000 farmers deliver to this station, under the supervision of Evans Kigombe and his team. 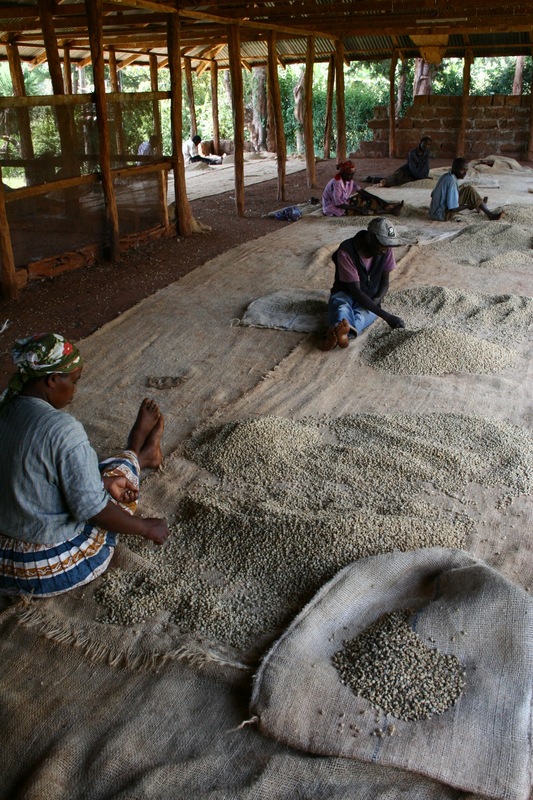 There was only a little bit of coffee left on the drying beds and a few sacks of parchment being hand sorted, everything back to peace and quiet after a hectic season. On our way back Othaya there was everything but peace and quiet, as the Kenyan elections are coming up and truckloads of enthusiastic campaigners paraded up and down the streets of the town center. By a stroke of bad luck we were unable to visit the Othaya dry mill, as the sitting president had scheduled a visit there at the same time as us. It would have been good fun to cup with him, but we settled for a late lunch and eventually made our way back to Nairobi. On my last day I headed back to Dorman to cup and re-cup the coffees I liked, narrowing down the list of lots to put in our container. Loaded up with tasting notes and samples to roast and cup back under London conditions, I feel pretty good about putting a selection together for purchase. I’m going to try to pick up a fair few smaller lots this year, to do more espresso experiments and fun exclusives for our subscribers, for example. 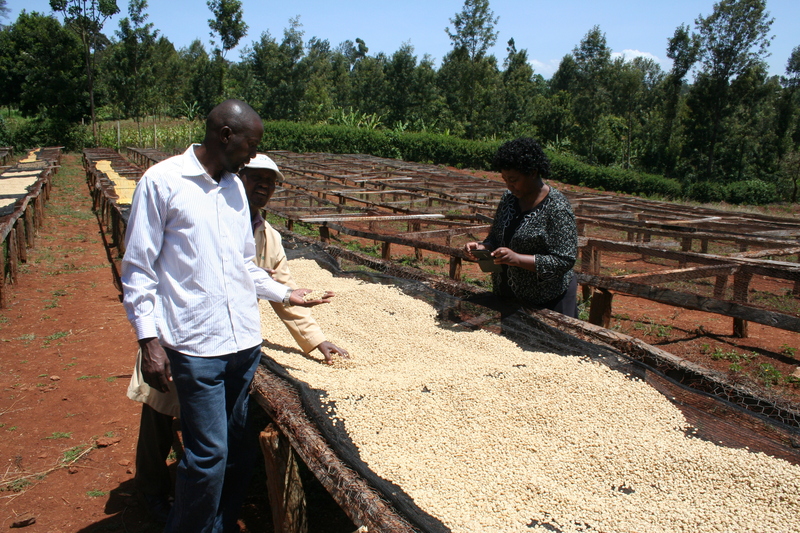 Stay tuned, It’s going to be a good year of Kenyas at Square Mile!